Brand Financial Training > AF1 > What is a deed of variation? 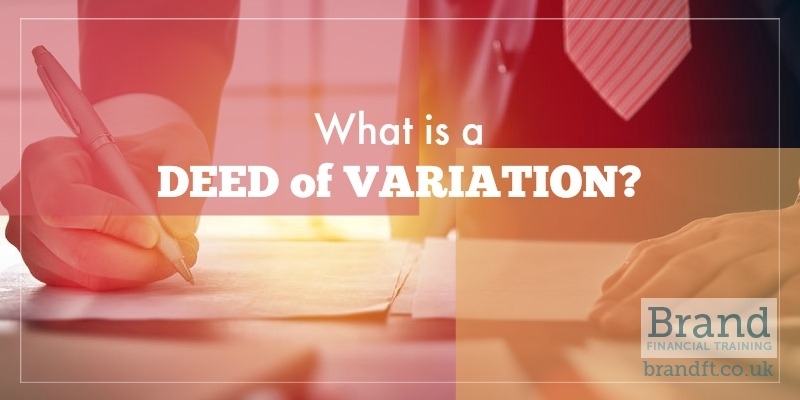 Recently we have had a couple of queries on how a deed of variation works. These can be tested within the CII written papers, J02, R06, AF1 and AF5 but may also appear in some of the multiple-choice exams such as CF8. A deed of variation is simply a document which allows the beneficiaries of someone’s estate to change the deceased’s will up to 2 years after they’ve died (as long as they are over 18 and of sound mind of course!). Also, it’s not just a will that can be re-written; the laws of intestacy, where someone has died without a will, can also be changed. They’ve been a long and well used method for many years now; for IHT reasons, to set up trusts and to allow families to skip a generation. Imagine that Bill has died and has left his estate to his son, Edward. Edward is already concerned about his own Inheritance Tax problems so decides to amend his father’s will using a deed of variation and re-directs the inheritance to his own children; Bill’s grandchildren. Using a deed of variation ensures that Edward hasn’t made a gift himself (and therefore avoids the usual need to survive 7 years) and also avoids worsening his own IHT situation. The advice, of course, has always been that individuals write a will and for this to be reviewed regularly to ensure it still does what it’s supposed to do. A deed of variation is essentially post-death planning and should never be considered as a substitute for pre-death planning. In order to be effective for IHT purposes, the variation must be in writing, and it must be made within 2 years of death. It must also clearly identify the part of the estate that is being varied and who will now benefit from that variation. One important point to note here (and the subject of the recent queries we have received) is that it must be signed by the beneficiaries who are due to lose out from the variation, which might not necessarily be all of them. The deed must also include a statement that the beneficiaries intend the variation to be effective for IHT and/or CGT. If you’re studying for your CII AF1 exam, and you’re not feeling 100% confident of a pass, grab our free taster to try out one of Brand Financial Training’s calculation workbooks for yourself. Click the link to download the AF1 Calculation Workbook taster now! Alternatively, you can download the taster for J02, R06 or AF5 if one of those exams is causing you to worry.